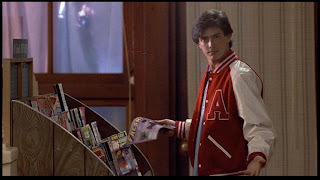 In case you dolls haven't noticed, strange things are afoot in movietown. A painful transition is afoot in which perfectly lovely movies are left rotting on the shelf while soul-crushing dreck winds up with at least three trailers and an international distribution. Major studios don't seem to understand that we're perfectly content to stay home and watch movies streaming on our monster-Black-Friday-purchased-on-credit-flat-screen TVs rather than shelling out nineteen dollars to see a Jack Black fart his way through a remake we never asked for. Something's gotta give. There are too many chefs in the kitchen and no one's buying the soup. If no one buys the soup, the restaurants close down. This happened to a company called Overture. 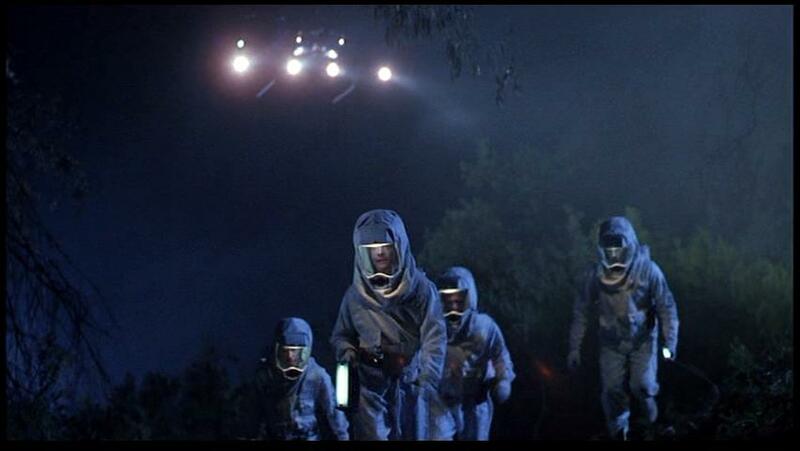 Overture made a charming and uncompromising little adaptation of a critically acclaimed foreign horror film. By the time the movie was done, they money was gone and Overture no longer had the ability to get the film distributed. This movie was not lowest common denominator. That's scary for a studio whose livelihood depends upon an opening weekend. So, rather than spend money to make people aware of the film, Relativity dumped it. 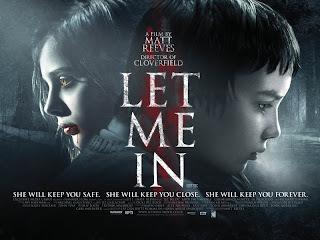 Let Me In was released in a handful of theatres opposite The Social Network and Wall Street 2 (both major studio releases costing upwards of 100 million to make/sell to the public), and so it tanked. It was gone two weeks later. Luckily, my memory is long. Studio politics aside, our first nomination in this year's FaggotyAssAwards is Matt Reeve's Let Me In. Whether you fall in love with a boy or a girl or a vampire, first love bites and its sting can stay with you for the rest of your life. Let Me In captures that moment quite well. Thoughtful, nuanced, and full of sequences that are sure to stick with you long after everyone's forgotten all about Wall Street 2, Let Me In is a film worthy of our adoration and respect. In the same manner that House of the Devil took the world by storm last year, I'm sure that this movie will have a long and happy life on home video. Whether serving soup in a park or shopping at the local convenience store, it's not really Thanksgiving without the homeless. My relationship with the local itinerants could be described as tenuous at best. One day I was leaving my CVS where I had just exchanged some change for a coke zero and dry pasta (I was between paydays), when a particularly rambunctious peasant lady asked me for some change. I replied, "I'm sorry, I don't have any change," to which she yelled out, "You don't have to be GAY about it!" Without thinking or hesitation, I yelled back, "You don't have to be homeless!" Every year I make a gigantic turkey and all the fixing and a lot of it goes untouched because I never learned to negotiate the dark meat. I tried to take it to the neighborhood food bank once and they explained that they can't take pre-cooked food because the tea-party people try to poison the homeless like sewer rats. Horrors! There’s a lot to be thankful this year. I got a cute new haircut. Sarah Palin’s wearing tank tops (to question the taste behind this would make me a member of the misogynistic, liberal media). But foremost, there’s the resurgence of long-form horror stories on primetime television. With The Walking Dead, Frank Darabont is back in the game and better than ever. But never forget how he got here. Darabont is, unquestionably, the definitive cinematic translator of Stephen King’s work (even The Walking Dead often feels like we’re watching appendices of The Stand). 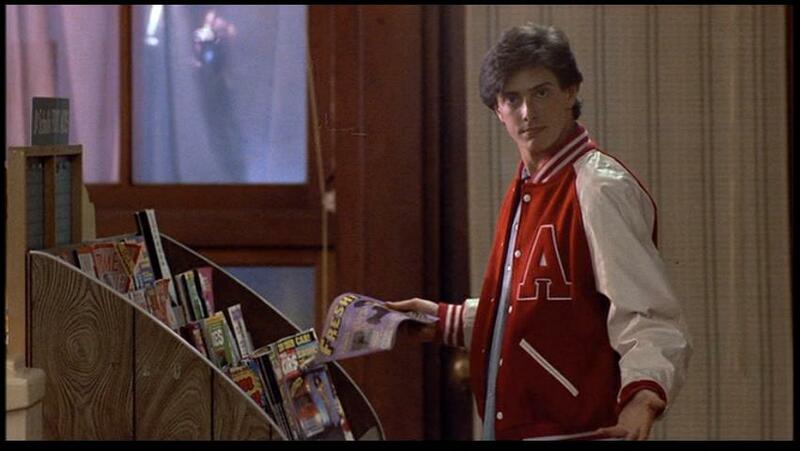 Along with Chuck Russell, he also wrote one of the greatest sequels in horror history, The Dream Warriors. That alone would be enough to garner Mr. Darabont a Faggotyass Grapefruit Basket. 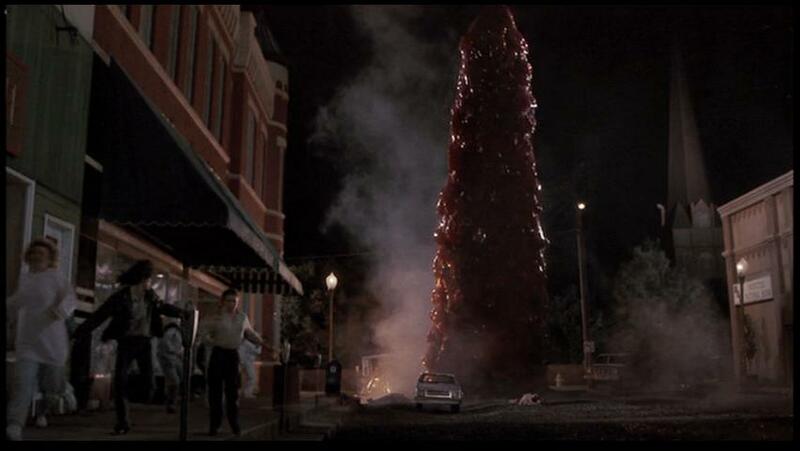 But Darabont and Chuck Russell teamed up one more time to raise the bar on the re-imagining of horror movie classics. Don’t call it a remake! 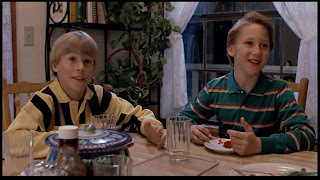 This year, I am thankful for The Blob (1988). "That boy doesn't need condoms, he needs a muzzle." 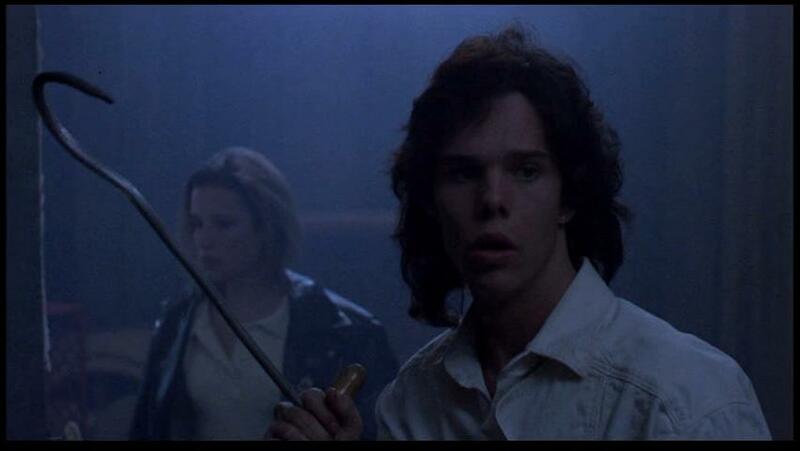 In The Blob, Shawnee Smith plays a woman in love with Donovan Leitch (Who isn't in love with Donovan Leitch?). She gets herself all gussied up for a date-night in her best, delicate pearl necklace and the latest hairstyle from her local Walmart stylist. Well, these two don't even have a chance to share a milkshake before they're running into Matt Dillon's brother (inexplicably dressed like a hybrid of Mickey Dolenz from the lost third season of The Monkees and Kristy McNichol). They're a regular couple of Hardy Boys, these two, turning what was meant to be a romantic evening into a mission to help the local homeless. Who says the gays aren't philanthropic? Shawnee doesn't seem to mind that Donovan Leitch has a lot more chemistry with Matt Dillon's brother than he does with her. She's prepared to take what she can get. Unfortunately, before Shawnee even has a chance to freshen up her femullet, Donovan Leitch is devoured by a giant, flesh eating hot pink blob (or is it heliotrope?)! How rude. 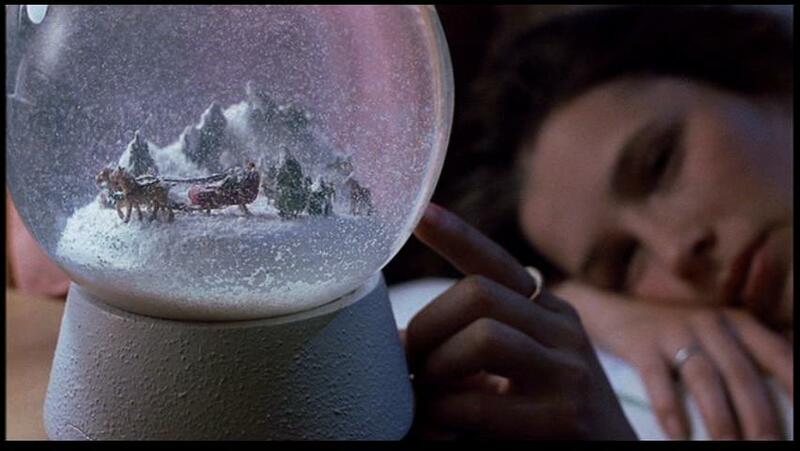 I respect Shawnee Smith because she understands that when your gay boyfriend dies violently of a highly contageous, virulent disease, the only thing a girl can do do is stare in soft focus at a snow globe. Never stick your hand down the garbage disposal. If you help the homeless, you're going to catch diseases. When your gay boyfriend dies violently in front of you, go home and change outfits before getting to the bottom of it. 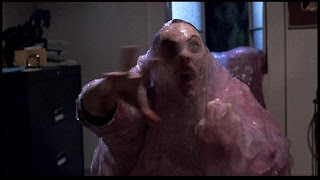 After Donovan gets gobbled up, the rest of The Blob is a pretty amorphous. Shawnee somehow winds up navigating the town's sewer system with two children in tow. Matt Dillon's brother gets captured by right-wing extremists hell-bent on using the Blob to defeat the Democrats. Shawnee loses a shoulder-pad. It's a little hard to follow, but more fun than eating an entire greenbean casserole.